Leading auto major Toyota Kirloskar Motor (TKM) on Thursday signed up India batsman Virat Kohli as its brand ambassador to endorse its range of passenger car models. "Kohli brings with him all the emotions that Toyota aims to offer its customers through its range of vehicles," TKM deputy managing director Sandeep Singh told reporters here on the occasion. 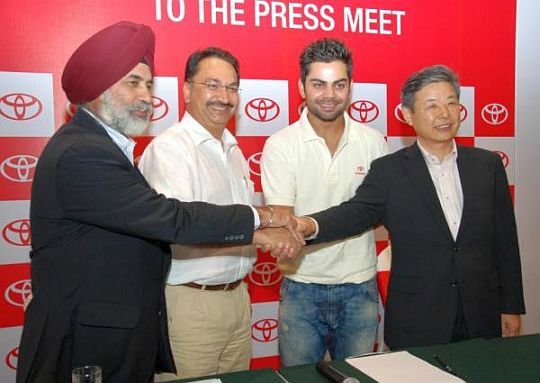 Raring to endorse the brand, Kohli said he was excited to be a part of Toyota's drive to connect with the youth. "Toyota inspires the spirit of success and that is an emotion that is close to my heart," Kohli told reporters here. Kohli is the first brand ambassador of the TKM joint venture, which has been present in the Indian automobile market over a decade. The Delhi-born Kohli is a star batsman of the Indian team in all the three formats of the game - Tests, One-Day Internationals (ODIs) and T20. He is also an integral part of the Royal Challengers Bangalore (RCB) team in the Indian Premier League (IPL-5) T-20 tournament. “Kohli personifies the younger generation. Behind his youthfulness is immense potential, talent and self belief, all of which Toyota stands for,” Singh pointed out.